Historically, descriptions of lower limb development and embryology have relied solely on detailed descriptions of the gross morphology of the developing embryo. Morphologic description is thus the foundation upon which our understanding of the complex and highly regulated process of limb outgrowth is based. An overview of this gross morphologic schema provides a framework for further studying the processes of regulation and patterning involved in the development of the lower extremity. Outgrowth continues into the fifth week. Within the fifth week (11-13 mm embryo), a flat, rounded foot disk develops. It is oriented in a transverse plane with the plantar or ventral surface pointing toward the head. Also at this time, the first stage of skeletogenesis occurs, termed mesenchymal condensation. It is present in the tibial/fibular region in the 11-13 mm embryo. The footplate soon begins to rotate inward, clockwise on the right and counterclockwise on the left. This results in the flexor surface obliquely facing the median sagittal plane of the embryo. The foot is more or less continuous with the leg, showing no dorsal angulation. Morphologically, the foot is divided into two craniad (preaxial) and caudad (postaxial) regions linked with the tibia and fibula. This arises because the interosseous groove of the leg extends onto the ventral aspect of the foot. The preaxial region comprises the second ray and the talus, navicular, and cuneiforms. The postaxial region comprises the third ray, cuboid, and calcaneus. In the 14 mm embryo, the foot will continue to develop so that the 5 rays evolve into a more fanlike structure. Rotation continues in the sixth week (14-16 mm), leading to nearly 90° of inward rotation. As a result, the tibial border now faces cephalad. At this time, digital rays have appeared and some notching occurs. As noted above, the foot now appears fan shaped with 5 rays. The second phase of skeletogenesis, chondrification, begins first within the central metatarsals. Notching of the footplate continues such that toes are clearly apparent in the 21-23 mm embryo. The most apical (third) toe is the longest, and footpads develop on the plantar surface. In the seventh week (22-24 mm), both feet are nearly sagittal in orientation. The tibial surface is cephalad and the extensor surface of the foot faces laterally while the plantar or flexor surface of the foot faces medially. There is as yet no dorsal angulation at the ankle, and the foot is in extreme equinus relative to the leg. The whole leg is, in essence, in external rotation. The toes and metatarsals are divergent. During the eighth week, the thigh continues to internally rotate. Chondrification proceeds and has reached the distal phalanxes (28 mm) and the malleoli (30 mm). Rapid changes are taking place at the region of the talus and malleoli. The sustentaculum tali becomes firmly developed, and the talus is extracted from its earlier position wedged between the malleoli. The lateral malleolus grows longer than the medial. The end of the eighth week signifies the end of the embryonic period and the beginning of the fetal period. All of the adult structures are in place. During the fetal period, the thigh internally rotates and the foot dorsiflexes (month 3) and pronates (month 3-9) into the adult position. The third stage of skeletogenesis, ossification, now proceeds. Vacuolar invasion of the talus at 43 mm heralds its onset. First to ossify are the distal phalanges and metatarsal shafts (week 9-10) followed by the proximal and middle phalanxes. The first tarsal bone to ossify is the calcaneus (5-6 mo). The talus ossifies at 8 months, and the cuboid may be ossified at birth. Stage one (second month): The foot is in ninety degrees equinus and adducted. Stage two (beginning of third month): The foot is in ninety degrees equinus, adducted, and markedly supinated. Stage three (middle of third month): The foot dorsiflexes at the ankle, but a mild degree of equinus is still present. The marked supination persists. The first metatarsal remains adducted. 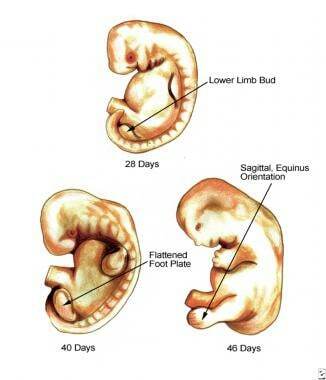 This stage corresponds to the fetal period of development. Stage four (beginning of fourth month): The foot pronates and reaches a position of midsupination. A slight metatarsus varus remains. The equinus is not present. The pronation continues during the remainder of fetal development and is not yet complete in the newborn. To grow an appendage such as a leg, an organism must overcome fundamental problems. First, the appendage must be positioned appropriately upon the trunk of the body. Second, the appendage must undergo outgrowth. In doing so, the appendage establishes its differential growth in relation to 3 axes. Lastly, the appendage must be shaped or patterned and must develop its functional components. The processes of outgrowth, establishing axes, and of patterning the limb are inextricably interwoven via a complex regulatory process. The process of limb formation relies heavily upon strict regulation of differential growth. Genes encoding outgrowth are highly conserved and termed homeotic genes. They lie in a defined order that corresponds to the topographic and temporal sequence of their expression along the outgrowing limb. In humans, these are the HOX genes. They are colinear and their ordering reflects their temporospatial sequence of expression. In developmental terms, the human lower extremity is divided into the zeugopod, the stylopod, and the autopod corresponding roughly to the thigh, leg, and foot, respectively. As the extremity grows outward, successively developing the zeugopod, stylopod, and autopod, the HOX genes are serially expressed down the line in successive overlapping fields, wherein each dominant wave of expression gives way to the next consistent with the colinear ordering of the genes. This system of orderly integrated genetic regulation is the current basis of researchers' scant understanding of the regulation in development of the lower limb. HOX genes are expressed differently in the upper and lower extremity. In particular, HOXC10 and HOXC11 are expressed sequentially in the lower extremity, whereas the upper extremity relies on HOXD and HOXA gene expression. The first problem in human limb development is not outgrowth but locating the point of outgrowth along the body wall. Little is known about the exact mechanism, but globally acting genes such as HOX9 and TBX4 seem to be crucial for hind limb placement. [1, 2, 3] They are expressed in the lateral plate mesoderm before outgrowth. Recently, PITX1 seems to be responsible for imparting lower limb morphology, perhaps by promoting TBX4 expression in the lateral plate mesoderm. The homeobox gene TBX5 promotes limb initiation by interacting with WNT and FGF10. Specification of limb identity and the outgrowth of the limb are not separate processes but are linked by TBX5 and WNT2B. Somites also may participate in the determination of the limb field. Although the presumptive field of outgrowth cannot otherwise be morphologically distinguished, experiments indicate that much has already occurred before limb outgrowth actually takes place. Even at this early stage, the ectoderm and mesenchyme interact, setting the stage for outgrowth. The ectoderm of the imaginal field already may be committed to the formation of the apical epidermal ridge (AER) through the transient expression of fibroblast growth factor (FGF). Dorsoventral polarization already has been established before limb bud projection, perhaps through dorsalizing and ventralizing influences of the somites and the lateral somatopleure, respectively. The limb bud develops in Wolff crest, a ring of thickened ectoderm. The mesoderm is believed to be the "prime mover." Experiments that removed this mesoderm produced no limbs, whereas experiments in which the mesoderm was transplant resulted in ectopic limbs. The ectoderm and mesoderm form a highly regulated primordium that displays the characteristics of a cleaving embryo. If a portion is removed, the primordium reorganizes to form an entire limb. If the imaginal fields are juxtaposed, superimposed, or disaggregated they also will reorganize to form one complete limb. However, if it is split and a barrier is placed between two halves, two limbs will form. The first outgrowth of the limb bud occurs with ectodermal expression of FGF-8. HOXB-6 expression also is involved. As the bud grows, the original overlying ectoderm is fated to become AER, and both dorsal and ventral polarized mesoderm is recruited for outgrowth. Surprisingly, some of the tissue recruited for lower limb outgrowth may overlap that which is recruited for the upper limb as well. Once initiated, outgrowth of the limb bud to limb completion is a function of the undifferentiated dividing mesenchyme known as the progress zone (PZ). The PZ underlies and is influenced by the AER. As always, ectoderm and mesenchyme interact and maintain each other. In this case, the ectodermal AER is linked to the mesenchymal zone of polarizing activity (ZPA). This feedback loop involves sonic hedgehog expression by the ZPA and FGF-4 by the AER. Without the ZPA, the AER degenerates and vice versa. The AER, in turn, promotes outgrowth by maintaining the proliferative zone in an undifferentiated and proliferative state. If the AER is removed, the limb will be truncated at a level corresponding to the age of the AER removed. p63 (a homologue of p53) seems to have a role in maintaining epidermal-mesenchymal interactions that result in AER formation. Mice that lack p63 have limb truncation deformities. FGF-2 and FGF-4 can sustain limb outgrowth. As the limb grows, 3 axes are established: anteroposterior, dorsoventral, and proximodistal. Transplantation experiments with chicks established the existence of a small area located in the base of the posterior limb that, when transposed to the anterior margin, resulted in an extra mirror image limb structure with posterior digits along the leading edge. This zone, or the ZPA, may be responsible for polarization along the anteroposterior axis. This axis lies along the plane of the toes with the little toe posterior and the great toe anterior. Retinoic acid beads mimicked the results of the ZPA transplantation experiments, causing the development of a mirror image limb. Therefore, the polarizing effect was postulated to fit a morphogen model of tissue induction. The ZPA may express a diffusable morphogen that polarizes cells along a concentration gradient. In this model, high concentrations of the morphogen (a retinoic acid analogue) signal posterior polarization and the development of appropriate posterior digits, while low concentrations signal for anterior position and structures. Retinoic acid is found in high concentrations in the posterior portion of the chick wing. Retinoic binding proteins and receptors also are located here, implicating a role for retinoic acid in anteroposterior polarization. The morphogen theory is an example of how individual cells may be exposed and even imprinted with positional information (in this case, a point along a concentration gradient). The positional information theory may explain how cells identify their position and then appropriately differentiate into the definitive shape and function of the extremity. Classically, dorsoventral polarization was attributed to the dorsal ectoderm. When an ectodermal jacket is transposed from a left-sided limb bud to a right-sided mesenchyme, a limb grew with left-sided dorsoventral polarity. In addition, when an AER is placed on a purely dorsal or ventral side of a bud, the resulting outgrowth has a jacket of two dorsal surfaces or two ventral surfaces, respectively. In the current model, dorsal ectoderm expresses WNT-7A, which in turn induces mesodermal LMX-1B. This institutes polarization of the mesenchyme. Ventral ectoderm expresses EN-1, which suppresses WNT-7A expression, thereby allowing the default ventral phenotype to develop. Dorsoventral polarization may start within the presumptive limb field before outgrowth. Limb field ectoderm may be polarized by opposition of dorsalizing and ventralizing signals of the somites and lateral somatopleure, respectively. As limb outgrowth recruits this ectoderm, the underlying mesenchyme in turn would be polarized via WNT-7A, LMX-1, and EN-1. In addition, localization of the AER is tied to dorsoventral polarization as the AER occurs at the border of dorsal and ventral cells. The AER develops at the border of Radical fringe (R-fng) and non-r-fng expressing cells. In addition, EN-1 may play a second role of limiting the ventral border of the AER in addition to its role in suppressing dorsalizing WNT-7A. The last axis, the proximodistal axis, may be defined as a function of outgrowth and the progress zone. As development proceeds down the limb, cells leave the progress zone and differentiate into appropriate mesenchymal structures (skeleton, connective tissue, and vessels). The gene MSX-1 (formerly known as HOX7) may be involved in keeping the PZ cells undifferentiated. The cells leaving the PZ may be, in a sense, polarized in the proximodistal axis by dwelling time within the PZ or the number of mitoses undergone. Lastly, the process of apoptosis or programmed cell death is involved in the development of the lower limb. This process occurs in the interdigital spaces, the joint spaces, and in certain primitive embryonic muscle layers. Sculpting of the foot itself is a complex, poorly understood process. The outgrowing limb flattens into a footplate capped by the AER. The number of toes that develop is proportional to the length of the AER. It was believed that the breakup of the AER initiated interdigital clefting but it now seems that the process is primarily a function of the interdigital mesoderm within the interdigital necrosis zones. The genetic mechanism of programmed cell death has yet to be identified. Lysozymal enzyme release may be the cellular mechanism by which apoptosis occurs. This would explain why steroids, which stabilize lysozymal enzyme membranes, may give rise to syndactyly. The tissues of the skeletal system are the first major tissues to show overdifferentiation in the developing lower limb. The development of skeletal tissues may take place in 3 phases: mesenchymal, cartilaginous, and osseous. When the lower limb bud first begins the process of outgrowth, it consists of bland-looking, morphologically undifferentiated mesenchymal cells in a thin ectodermal jacket. As cells migrate from the progress zone (PZ) during the process of outgrowth, they become differentiated mesodermal cells. Subsequently, mesenchymal condensations occur, which form the anlage of the skeletal system. This occurs in the fifth week at the 11-13 mm stage. Differential growth after migration from the PZ determines the ultimate size of the skeletal elements fashioned. This growth may occur in accordance with positional information. The mesenchymal condensation occurs in a proximal to distal fashion, forming the centrally located blastema. Ectoderm has an inhibitory effect on cartilage formation that may explain the central location of the blastema. At the end of the embryonic period, cartilaginous models of the adult skeletal forms have been fashioned. In addition, densely cellular regions termed interzones also have occurred. From these interzones, the joints of the lower extremity develop. See Molecular aspect of chondrogenesis and digitation below. As the process of chondrification occurs, the central diaphyseal cells hypertrophy, radially compressing the surrounding mesenchymal cells, which condense into the periosteum and perichondrium. Matrix secretion abets this process. Radial growth becomes restricted but longitudinal growth remains uninhibited, allowing for elongation of the skeletal components. The process of radial compaction does not occur in the epiphysis, perhaps explaining the enlarged diameter here. The phase of ossification is heralded by vascular penetration of the cartilaginous models. This occurs in the talus at about the 43 mm stage. This is followed by penetration of the calcaneus, navicular, cuboid, cuneiforms, and metatarsals. Ossification starts in the periosteal collars within the central areas of the cartilaginous models destined to become tubular bones (such as the diaphysis of the metatarsals). This process proceeds from proximal to distal in the leg. The forefoot ossifies before the hindfoot at 3-5 months in the sequence: distal phalanx of the great toe, metatarsals, distal phalanges, proximal phalanges, middle phalanges. In the tarsus, ossification proceeds from calcaneus to the talus (at 8 mo) to the cuboid (the last bone that may be ossified at birth). Ossification continues in the postnatal period. As chondrification and ossification proceed, important morphologic changes occur. In the foot, the 13.5-mm embryo has 1 median and 2 lateral mesenchymal rays that become 5 fanlike rays in the 14-17–mm embryo. Over the course of the embryonic and fetal periods, the divergence and rotation of these rays decrease to attain the adult form. Important changes also occur in the tarsal morphology. In the 27-mm embryo, the talus is low and slightly overlaps the calcaneus. No torsion of the head or declination of the neck is evident at this time. The talus is essentially wedged between the malleoli (the medial being longer than the lateral). The talus undergoes elongation. The head turns more laterally, the height of the body increases, and the neck-trochlear declination angle decreases as the talus is "extracted" from between the malleoli in the fetal phase. This helps to correct the supination of the foot. In the fetal phase, the calcaneal body grows faster than the head, and varus torsion diminishes. The relation to the talus changes such that adduction of the foot is corrected. Lastly, reduction of the length of the phalanxes occurs at the distal phalanges, and the great toe gains dominance in length. As mentioned above, joints develop from densely cellular regions of the mesenchymal condensations termed interzones. Homeotic genes may regulate the position of these interzones. A joint cleft occurs before actual muscle innervation or motion occurs. Cavitation in the middle, vascular layer subsequently gives rise to the joint space in a process that also is independent of muscle activity. However, once the joint interspace has cavitated, muscle motion must be established to preserve it. Incomplete capitation helps to explain the plica that may arise in the knee joint. In order to produce a digit (or any bone, cartilage, or ligament of the body), the actual tissue (eg, bone, cartilage) must first be made (chondrogenesis) and then be "sculpted" through final differentiation and morphogenesis. The regulation of the formation of the cartilaginous anlage is attributed to 3 primary chondrogenic factors: (1) chondrogenic triggering signals (transforming growth factor β [TGFβ], activins, and bone morphogenetic proteins [BMPs]);  (2) cartilage identity genes (eg, group E Sox genes); and (3) chondrogenic extracellular matrix. The matrix forms a scaffold for chondrogenic aggregation of cells but also seems to regulate local delivery of chondrogenic triggering signals in precise concentrations and temporal relationships. In order to focus on molecular relationships, the Montero and Hurle identify a zone beneath the apical epidermal ridge [AER] and PZ conceptualized as a "distal aggregating region," which contains a zone of early differentiation and a more proximal region of later differentiation, resulting in a segmented digital ray. The idea is that cells proliferating in the progress zone leave it and follow one of two pathways: incorporation into the growing ray cartilage or apoptosis. The distal aggregating region is where differentiation into the ray cartilage occurs. The earliest step in chondrogenesis is condensation of the undifferentiated mesenchymal cells into aggregates. TGFβ and activins may play redundant signaling pathways specific for triggering chondrogenesis of the rays (rather than unspecific chondrogenic signaling). This process involves up-regulation of activin receptor-like kinase 6 (ALK6) (BMPR1B), which seems to be the main chondrogenic receptor for the limb bud as it is expressed in the prechondrogenic aggregates of all limb skeletal elements. BMPs have opposite growth-promoting and apoptic effects, which probably depend on the finely tuned local expression of different receptors. They exhibit well-defined expression domains in the developing digits but not at the tip, except for growth differentiation factor 5 (GDF5). Combinations of BMPs are differentially implicated in the distinct skeletal elements of the limb. Chondrogenic effects of BMPs include the promotion of cell adhesion in prechondrogenic aggregates, the up-regulation of SOX genes, and the production of matrix. The earliest sign of chondrogenic commitment is the expression of SOX9, which may also be a protector against the apoptic-promoting effects of BMPs. The BMP receptor ALK3 (BMPRIA) may be a key modulator of joint formation and interdigitation via apoptosis. Overactivation of the TGFβ pathway via SMAD2 is present in autopodial anomalies such as arachnodactyly, camptodactyly, and polydactyly. Extracellular matrix (ECM) has a central role in chondrogenesis. At first, it acts as a scaffold for aggregation. It probably also effects the local delivery of growth factors, both in terms of timing and in terms of concentration differentials. Components of the ECM are themselves differentially concentrated within the developing ray. For instance, the proteoglycan syndecan-3 is highly expressed in prechondrogenic aggregation restricted to the perichondrium and the developing joints (after differentiation). Components of the ECM include fibronectin, proteoglycans, tenascin, elastin, and fibrillins. Severe disorganization of the interdigital scaffold of elastin and fibrillin precedes the induction of ectopic digits. Myogenic mesodermal cells originate in the somites and migrate into the developing lower limb early in the embryonic phase. These cells do not seem to have any intrinsic guidance but probably follow the lead of connective tissue. They express extracellular fibrils that allow them to interact with the extracellular matrix. These cells coalesce into common muscle masses. The myoblasts grow by hypertrophy and fuse into myotubules. The common muscle masses split to fashion the definitive muscles of the lower extremity. Cell death is involved in shaping. Viable muscle requires innervation. Tendons develop independently and are derived from limb bud mesoderm rather than the somites. In fact, tendons will develop in the absence of muscle, only later to disintegrate. In the 6-mm embryo, an axial artery arises from the dorsal root of the umbilical artery. This artery soon passes posterior to the skeletal anlage and gives rise to several dorsal branches before reaching the foot. One of these becomes the ramus perforans tarsi. At the 14-mm stage, a femoral artery has entered the leg and communicates with the axial or sciatic artery via a superior communicating artery. Also at this stage, the axial artery communicates anteriorly by the ramus perforans cruris that penetrates through the proximal tibial-fibular interspace. In the 17.8-mm embryo, an anterior tibial artery arises from the ramus perforans cruris. Four arteries now reach the foot: arteria tibialis posterior superficialis, arteria peronea posterior superficialis, arteria interossea (formerly the axial artery), and the tibialis anterior. At 22 mm, the sciatic artery disappears and the femoral artery supplies blood to the leg. The arteria interossea regresses, as does the arteria peronea posterior superficialis. The lateral terminal branch of the latter joins the ramus communicans inferioris to become the adult peroneal artery. By the eighth week, the adult pattern of vasculature is established. Motor nerve outgrowth from the spinal cord occurs in an orderly fashion. Nerves from the medial cord grow to innervate the ventral muscles, while those of the dorsal cord supply the dorsal muscles. Research has not determined how the nerves make their way to the target cells. The nerve trunks advance with a roughed leading edge termed the pioneer growth cone. The filopodia of the growth cone allow for close contact with the mesenchymal cells, which may act as signaling cells for guidance. Cohn MJ, Patel K, Krumlauf R, et al. Hox9 genes and vertebrate limb specification. Nature. 1997 May 1. 387(6628):97-101. [Medline]. Isaac A, Rodriguez-Esteban C, Ryan A, et al. Tbx genes and limb identity in chick embryo development. Development. 1998 May. 125(10):1867-75. [Medline]. Logan M, Tabin CJ. Role of Pitx1 upstream of Tbx4 in specification of hindlimb identity. Science. 1999 Mar 12. 283(5408):1736-9. [Medline]. Zhu X, Zhu H, Zhang L, Huang S, Cao J, Ma G, et al. Wls-mediated Wnts differentially regulate distal limb patterning and tissue morphogenesis. Dev Biol. 2012 May 15. 365(2):328-38. [Medline]. Kaltcheva MM, Anderson MJ, Harfe BD, Lewandoski M. BMPs are direct triggers of interdigital programmed cell death. Dev Biol. 2016 Mar 15. 411 (2):266-76. [Medline]. Ramakrishnan PK, Henry BM, Vikse J, et al. Anatomical variations of the formation and course of the sural nerve: A systematic review and meta-analysis. Ann Anat. 2015 Nov. 202:36-44. [Medline]. Zeller R, Duboule D. Dorso-ventral limb polarity and origin of the ridge: on the fringe of independence?. Bioessays. 1997 Jul. 19(7):541-6. [Medline]. Barboza-Cerda MC, Campos-Acevedo LD, Rangel R, Martínez-de-Villarreal LE, Déctor MA. A novel phenotype characterized by digital abnormalities, intellectual disability, and short stature in a Mexican family maps to Xp11.4-p11.21. Am J Med Genet A. 2013 Feb. 161A(2):237-43. [Medline]. Beatty E. Upper limb tissue differentiation in the human embryo. Hand Clin. 1985 Aug. 1(3):391-403. [Medline]. Boehm, M. The embryologic origin of club foot. J Bone Joint Surg. 1929. 11:229. Carlson BM. Human Embryology and Developmental Biology. 1994. Chen H, Johnson RL. Dorsoventral patterning of the vertebrate limb: a process governed by multiple events. Cell Tissue Res. 1999 Apr. 296(1):67-73. [Medline]. Couso JP, Bishop SA. Proximo-distal development in the legs of Drosophila. Int J Dev Biol. 1998. 42(3):345-52. [Medline]. Gibson-Brown JJ, Agulnik SI, Chapman DL, et al. Evidence of a role for T-box genes in the evolution of limb morphogenesis and the specification of forelimb/hindlimb identity. Mech Dev. 1996 May. 56(1-2):93-101. [Medline]. Graham A, McGonnell I. Limb development: Farewell to arms. Curr Biol. 1999 May 20. 9(10):R368-70. [Medline]. Mills AA, Zheng B, Wang XJ, et al. p63 is a p53 homologue required for limb and epidermal morphogenesis. Nature. 1999 Apr 22. 398(6729):708-13. [Medline]. Montero JA, Hurle JM. Deconstructing digit chondrogenesis. Bioessays. 2007 Aug. 29(8):725-37. [Medline]. Morrissy RT, Weinstein SL. Lovell and Winter's Pediatric Orthopedics. 1996. 16-17. Ng JK, Kawakami Y, Buscher D, et al. The limb identity gene Tbx5 promotes limb initiation by interacting with Wnt2b and Fgf10. Development. 2002 Nov. 129(22):5161-70. [Medline]. Parmantier E, Lynn B, Lawson D, et al. Schwann cell-derived Desert hedgehog controls the development of peripheral nerve sheaths. Neuron. 1999 Aug. 23(4):713-24. [Medline]. Robertson KE, Tickle C. Recent molecular advances in understanding vertebrate limb development. Br J Plast Surg. 1997 Feb. 50(2):109-15. [Medline]. Sarrafian SK. Development of the foot and ankle. Anatomy of the Foot and Ankle: Descriptive, Topographic, Functional. 1993. 1-36. Serrano N, O'Farrell PH. Limb morphogenesis: connections between patterning and growth. Curr Biol. 1997 Mar 1. 7(3):R186-95. [Medline]. Tachdjian M. Development and ossification of the foot and leg. The Child's Foot. 1985. 39-44. Zakany J, Duboule D. Hox genes in digit development and evolution. Cell Tissue Res. 1999 Apr. 296(1):19-25. [Medline]. Zaleske DJ. Development of the upper limb. Hand Clin. 1985 Aug. 1(3):383-90. [Medline]. Zuniga A, Haramis AP, McMahon AP, et al. Signal relay by BMP antagonism controls the SHH/FGF4 feedback loop in vertebrate limb buds. Nature. 1999 Oct 7. 401(6753):598-602. [Medline].